LPG subsidy directly to bank account will start from 1st June, 18 districts to start with, whole country to follow soon! Remember my tutorial for downloading Aadhaar Card. In the post I had reported at that time, that the authorities will soon be moving towards a structure where all the LPG subsidies you are entitled to, will be directly paid into your Aadhaar Card linked bank account. Now the Government is planning to implement the same in a rightful earnest. The authorities are going to start the scheme from June 1, 2013 with 18 districts namely Anantpur, Chittoor, East Godavari, Hyderabad and Ranga Reddy in Andhra Pradesh; Diu in Daman and Diu; North Goa; Bilaspur, Hamirpur and Una in Himachal Pradesh; Tumkur in Karnataka; Pathanamthitta and Wayand in Kerala; Wardha in Maharasthra; Pondicherry; SBS Nagar/Nawanshahar in Punjab and East Nimar (Khandwa) and Harda in Madhya Pradesh. And from 1st July, 2013, it will be implemented in Mandi and Mysore districts of Karnataka. The rest of the country is to follow soon in a phased manner. So if you have not yet heard about this, or linked you Aadhar Card to your bank account you can head over to your branch and do it now. State Bank of India had advertised a few days back about the fact and invited its customers to link the Aadhar Card to their bank accounts. If you are a HP LPG customer and want to know more about linking your Aadhaar Card to Hindustan Petroleum Corporation Ltd (HPCL) visit my blog here, wherein the hyperlinks about login to linking are provided. These links were provided by HPCL itself to me. Another question many of my friends, readers and colleagues ask? why this additional work or 'Jhanjhat'. 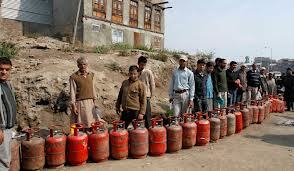 Did you know that around 20 % of LPG cylinders which belonged to you, genuine users, were sold in the black market by operators. Their modus operandi was simple and straight forward. They would study your usage pattern and develop a way to assign a cylinder in your name and sell it in black market. If you required 1 cylinder every month, they would book 2 in your name, deliver 1 to your address and sell the second one at a neat and handsome profit of around 200%. Even right now after the price rise and restrictions on the LPG cylinders per year, the residential cylinders are available in black market at Rs.1200.00 and the commercial ones @ Rs.1900.00 (this is the rate in Mumbai). So one fine day when all the LPG connections through out the country are linked to a central data base viz UIDAI authority through Aadhaar Card, and the subsidy is directly paid to the users, the leakage and pilferage will stop because everything will be online and no paper money is exchanged. Join the Aadhaar revolution, support the Government in its efforts to weed out the black marketeers who themselves are reason for high prices of LPG. If you have any questions, suggestions or comments please do so in the comment box and I will answer them promptly. should we term this is a nice initiative or a politically correct one ?? My dear learned friend,,How simplistic can you get in singing praises about AADHAR and even to the extent to glorifying it as if its a panacea to corruption!! The horrendous ordeal of getting an AADHAR card in my state ( TN) where it was even stopped midway in 2011 to revise the issue of already issued lakhs of cards for Biometric data updation using census, is seen to be believed. There is no news of the scheme being relaunched in earnest even today,I called their help line 18003001947.. The biometric data is most insecure in this country and can be stolen and any fraud can take place and fingerprints are climching eveidence!! Declaring one's bank accounts freely to gas agency/ oil companies is like inviting a burglar home with a red carpet..You must have surely heard of bank account frauds in this day of Digital age.. Besides when UPA-II govt falls and NDA or other steps in, how serious will they be in continuing this painfully slow reimbursement scheme? Nagesh Sir, I believe what you say is right but to remember to map 1.35 billion people is not an easy task and there are going to be hiccups like the ones you have mentioned. As far as giving data to a Govt. agency is concerned, we all ready give all kinds of data to the Government so from the risk point of view we are always vulnerable. How do you guarantee you money is safe in the bank. Nobody can. Remember UTI, millions lost money in the UTI 64 scheme (A govt one) but does that stop us from saving our money in banks. No Sir! it is a risk we have to take. As far as NDA is concerned, I dont think it will roll back the Aadhaar or the subsidy payment. Nobody can do that now if the Govt wants to control the CAD and inflation. Do remember Sir, this is the biggest citizen mapping exercise in the world and somewhere we should feel proud about it.